Reference: D. James, Economics, Environment and Sustainable Development, Resource Assessment Commission, RAC Occasional Publication No 1, June, 1991, p. 2. Any economist will tell you that the environment really ought to be classified as a resource; hence it should fall fairly and squarely into the policy arena concerning the allocation of resources. 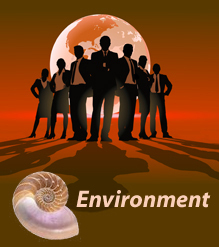 Management of the environment is essentially an economic problem. Reference: 'Achieving Sustainable Development: A Practical Framework', Business Council of Australia, 1991, p. 9. Rather, it is that important environmental assets tend not to be priced in a market like other assets. These assets are common property - they belong to everybody, and to nobody. Without ownership rights there is not the incentive for any person or group to look after them properly... if the environment has a zero price to users it will eventually be used up. Reference: T.H. Tietenberg, ``Using economic incentives to maintain our environment', Challenge, March/April, 1990, p. 42. In order to fix this perceived problem, sustainable development involves putting a price on the environment and charging people to use it, privatising the commons, and creating artificial markets and price mechanisms through economic instruments and tradeable rights to pollute. The idea is that "the power of the market can be harnessed" to environmental goals. However, the real problem is not that the environment is not privately owned or valued on the market but rather that economic considerations take priority in most countries around the world. The tragedy of the commons is not that there are commons but rather the freedom of the commons. The lack of legal sanctions combined with a value system that promotes the raising of individual economic interest to a primary decision-making principle is what destroys the commons. Seen in this light, economic instruments, privatisation and environmental `valuation' are all mechanisms for perpetuating the central problems that caused environmental degradation in the first place. They ensure priority is still given to economic goals and they enable individuals and firms to make decisions that affect others on the basis of their own economic interests. The primacy of `free' markets in environmental decision-making ensures that power remains in the hands of those who direct and control financial resources; the wealthy, the corporations and the economists they employ. Reference: Vandana Shiva, `Ecologically sustainable: What it really means', Third World Resurgence 5, January 1991, p. 9. Vandana Shiva, an Indian activist, points out that sustainability should require that markets and production process be reshaped to fit nature's logic rather than "the logic of profits and capital accumulation, and returns on investment" determining nature's fate. Instead, she says, sustainable development "protects the primacy of capital. It is still assumed that capital is the basis of all activity."